I asked my good friend Nadine to share about the why + how of her "Refresh Series" - why she's taking time to intentionally refresh her life! I encourage you to read her words and see if there are any areas of your life that need refreshing. Picture this: You pull up in the car to an old house you've driven by many a time. You're pretty sure you've been inside, but it has been a long time so you're not really sure if you remember what all the rooms look like. You stop the car, climb on out, walk up to the house, and let yourself in. As you walk through the rooms, you can't help but notice a few things. You notice a certain musty smell, one caused by windows that have been shut for a few years too long. You notice that the colours on the walls seem faded, which is odd because all the windows are boarded up and no light has been in for a while. You can't help but feel a creak, a constant groan as you walk around on the hardwood floor. Yet at the same time, you love hardwood floors. You kind of like the styling of the house, even if it is a bit outdated. You like the layout, and you appreciate the heritage that you see around you. You realize that there a few things you can do to fix the problems. Some things will take time, but some things will help immediately. You walk to the window closest to you and fling it open. As the dust is settling, you walk over to the next window and do the same. Your first step is to increase the airflow and let in some light. Once you've done that, you start evaluating the issues. The walls definitely need a fresh coat of paint. The floors need a good scrub. The furniture should be replaced. The lights are out so you just need some new bulbs. That's kind of what my life has been for a while. Mackenzie asked me to share why I started my refresh journey; it all comes down to the fact that I realized my life needed a little help. A few months ago, two friends of mine wrote an ebook called the refresh book. I started reading it mere minutes after it was released, and was immediately inspired to change. I started to recognize that I wasn't satisfied with the things that I was doing and if I wanted to be satisfied I had to make distinct changes in order to fix the problem. That's really the heart of my refresh series. It's not about getting things perfect, and I promise that if you met me in real life you would recognize in about half a second that I'm not perfect. I am however, a girl making a valiant attempt at change. trying. I am looking in my life and I'm looking at the things going on and I'm looking for ways to solve the small issues that I can. 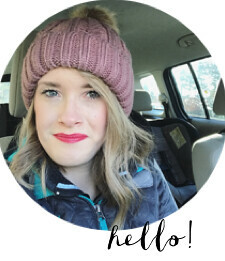 I've really covered a variety of topics as I've blogged through my changes. I've trying to cover as much of my life as I can. I wanted to look at how God could go to work in the small areas of my life. I invited Him in and asked Him to do some weeding. I wanted to learn how I could glorify God in the way that I set out to refresh myself, in how I put on make up, in the way I shop, in the way that I spend my time, in how I live out joy, in how I deal with social media, and in all the things that make up my life. I feel like this refresh series that I'm going through, is far from over. If anything it's barely even begun. I don't know where it will go,but I have lots of ideas and am excited to share them. Feel free to stop by my blog every Wednesday to join me in my refresh series. I promise you my journey isn't perfect, and trust me when I say I still have a lot of musty rooms that needs some fresh air. You can find Nadine blogging at A Secondary Heartbeat and Tweeting as nadinewouldsay!